Big thanks to my patrons. Your support is greatly appreciated. Please visit my Patreon page here. BIG CHANGES HAPPENING AT BOBBY'S PATREON IN 2018! SEE BELOW! 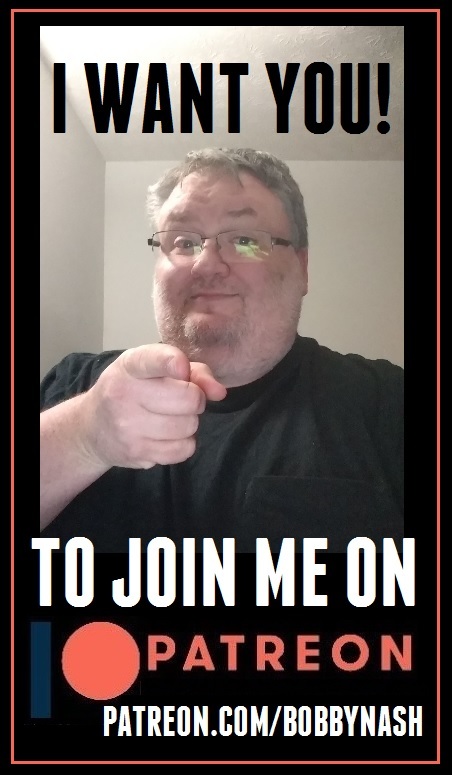 WELCOME TO BOBBY'S PATREON 2.0! Hi. 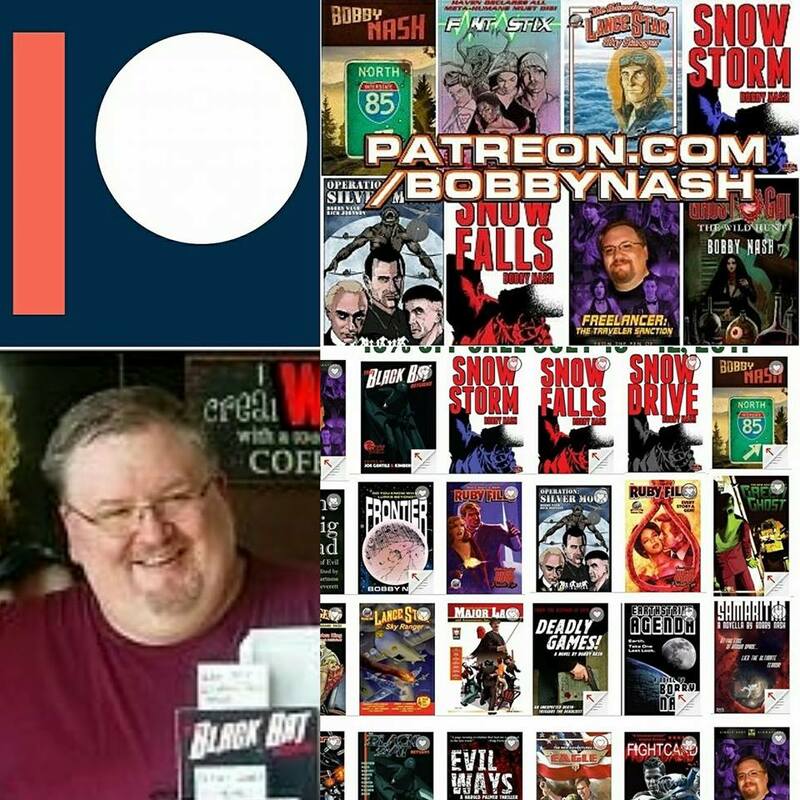 Thanks for visiting Bobby's Patreon 2.0 page. 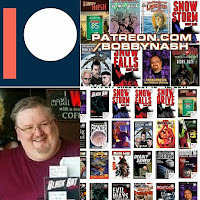 Please feel free to look around at www.patreon.com/bobbynash. A Big Thank You to my patrons for their continued support and encouragement. It means the world to me and I look forward to continuing our creative journey together. ​When I started this page, it was to help raise a little extra money for convention travel. In 2017, I found myself underemployed on the day job front and caring for two sick parents, which equaled a full time job. ​At that point, Patreon became a means to help pay some bills. As I go into 2018, I am redoubling my efforts to write full time and make my freelance writing and my BEN Books creator-owned publishing imprint a going concern. Patreon money will help me keep eating and a roof over my head while I get things moving. ​I've also talked with my patrons and after hearing their ideas and feedback, I am making some changes to the page. The monthly sketch giveaway has been tabled for the time being. I still love doing them, but with a limited number of patrons they were winning often and after a while, the free art loses some appeal, I think. ​Free giveaways will become more organic going forward. At times, I will do a drawing for either paperback copies of new releases or a sketch or whatever I have that is perfect for a giveaway. I'm working up some cool ideas on that score. Stay tuned for details as I get everything ironed out. ​These giveaways would be exclusive to patrons. ​Another area of interest was in doing blog post style tutorials about writing. I recently released a post about creating the cover for my novel, Deadly Games! and I am planning a series of posts about the creation process I use when writing. Those are coming up soon and will be exclusive to patrons. ​I am also playing around with the idea of doing Patron exclusive interviews with other creators where we will discuss the creative process. Those would start as patron exclusives and then rolled out to the general public at a later date. I'm still trying to work the bugs out on this. ​These are early day ideas. As always, I am open to suggestions. If there are topics you would like me to blog about, I would be happy to take suggestions. If you've got questions, send them along as well. I'll answer them here as well. ​The monthly ebook giveaway will not change and I will make ebook copies of all of my new releases available to you as well, publisher permitting (although, so far this has not been a problem). ​Thanks again for your support. ​Let's go create something together! Well, it's official. I've built myself a Patreon page, which you already know since you're here, right? Welcome. I'm still learning the ropes here so please bear with me as I stumble around to find my footing. Also, please share the link with your friends if you don't mind. Why start a Patreon page you might ask? This is one of those questions I expect to get a lot. After all, I am a published author of many titles and have even won an award or two for my work. Don't believe it? Check out www.bobbynash.com where I'll happily tell you all about it. For as long as there have been artists (and by artists I mean painters, writers, actors, sculptors, musicians, and the like) there have been patrons of the arts, those generous souls who donate to those crazy, madcap creative types to help them live while they create their art. Sometimes, as in the case of Patreon, this is a monetary donation. I originally started this Patreon page as a way to help cover the costs associated with writing and traveling to conventions, of which I do about 15 a year, on average. I would love to travel greater distances for cons to spread the word about my work. In recent months, my day job went away and now I'm trying to make a go of it as a full-time writer while taking care of my ailing father. I was also taking care of my mother, but she, sadly, lost her battle with cancer on September 1, 2017. ​So far, I'm off to a good start, but still not quite enough to pay the bills so Patreon funds will also go toward paying the occasional car payment or phone bill. The bills never seem to stop coming, do they? I'm using Patreon like a subscription service for my books. Each month, I send out at least one ebook to my patrons at the $5 and above levels. If a book is released in that month, they will get that one as well. Some months, they get one, but usually it is more than one. $5 a month is actually cheaper than buying them outright, but this way the majority of the money flows to the author. For those interested in supporting me here, first off, Thank You. I offer some exclusive and first looks at novellas I'm producing myself through my BEN Books imprint. Patreon supporters will see those before anyone else. I do a monthly giveaway and supporters names will go in the hat for those prizes. I'll also do the occasional artwork for supporters as well. I can also do either hangouts or Skype groups as well once I work out the logistics. There's also an idea I'm floating for one on one or group tutorial sessions. I think that could be fun. I'd love the opportunity to meet my Patrons face to face at conventions and offer a special deal or two at my table. I'm sure other ideas will come to me as I go along, but if you have any ideas, I'd love to hear them. Maybe we can make them happen. If you've read this far down and are still interested, please visit my Patreon page. I appreciate your support. Let's create some cool stuff together. BOBBY'S MOVIE REVIEW - HELLBOY! Join me for Indie Author Day this Saturday!